OOAK (one of a kind)Handcrafted by O'Dare. Miniature Handmade 4th Of July Fairy House. It is signed and dated by O'Dare. The stand is painted with gold gilt and cut outs in the wood. It has four glass sides, velvet lining, curved wood legs and a slide away glass piece to enable you to put things inside. THE BIGGER THE COLLECTION, THE BETTER. All my books that are 1/12 scale have miniature hard covers. Most of my miniature books are readable BOOKS. They are printed on both sides of the page with a readable passages drawn from the actual book being depicted. OOAK (one of a kind)Handcrafted by O'Dare. Miniature Handmade Tiny Fairy House In A Faux Walnut Shell. It is signed and dated by O'Dare. I hope that you find that it looks better in person. It is 1 5/8" high. OOAK (one of a kind)Handcrafted by O'Dare. Miniature Handmade Fairy Easter Egg House. It is signed and dated by O'Dare. I hope that you find that it looks better in person. It is 1 1/2" high. 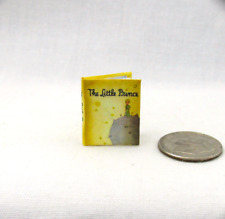 Totally cool, great choice of recognizable books even tho tiny ~ SET OF ¼” SCALE COOK BOOKS. It is painted in a fine gold to preserve all the detailing, but can be repainted using an acrylic paint. Beautiful handwork. (DOLLHOUSE MINIATURE ARTISAN CUTE LITTKE WHITE FLUFF BALL POODLE. HAS MAKERS STICKER ON BOTTOM. I respond as quickly as possible. I have seen unimaginable things in young childrens ears and nose :). The title is printed on the spine so it will look GREAT open or closed.The full size edition Peter Pan was originally published in 1902 by J.M. Barrie and illustrated by Arthur Rackham. I was able to fit seven of Rackham's wonderful illustrations into my miniature 1/12 scale replica. OOAK (one of a kind)Handcrafted by O'Dare. 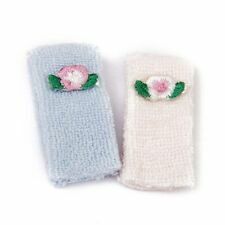 So cute little Easter Fairy house scene in a watch pennant or locket or just use as a display piece. The story is filled with adventure and romance for our little Penny. Each hand made book takes 2 weeks to create and about an hour each to hand cut and put together. Artisan made dollhouse miniature dog made to 1:12 scale. This charismatic miniature hand carved dog has very realistic features and is hand painted. Signed by JT, in 1983. Perfect condition. 2” tall. Dollhouse miniature 1:12 scale. Inspired by a beloved rag doll of childhood.The doll is made from plastic, and hand painted. 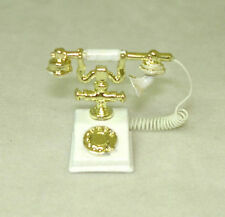 Makes a great gift for miniature collectors and enthusiasts. Doll 5/8" x 1 3/8". Up for sale is this beautiful miniature console table by artist Jason Getzan. This is pre-owned in excellent condition. This is a console table in gold with a "Venaro White" shaped top. It is signed and dated by the artist at the bottom. 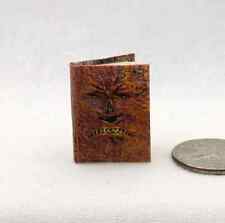 The two books shown are item number 172416672912 BOOK OF THE DEAD Illustrated Miniature Book Dollhouse 1:12 Scale Black Egyptian and item number 172416662748 BOOK OF THE LIVING Miniature Dollhouse 1:12 Scale Book Amun-Ra Ancient Egyptian. Prettiest turkey platter.all porcelain, beautifully painted with grapes, vines and beautiful turkey. This has initials on the backside 'MSS 84'. It is all porcelain and it's gorgeous. There's nothing listed earlier than 1993 and most are artisan pieces from the early 1980's - 1993. Dollhouse Miniature 1:12. This is small and is not intended for small children as they may choke on it. DOLLHOUSE MINIATURE ARTISAN SIGNED MARY OBRIEN HAND PAINTED TIN BOX. LOVELY AND PERFECT. LID DOES OPEN. PLEASE FEEL FREE TO CONTACT ME WITH ANY QUESTIONS. This is a sweet little baby bear who stands in a tiny open trunk. This from World ofMiniature Bears. She has tiny bead eyes. She stands in a trunk filled with her birth certificate, baby bottles, baby oil, powder, shoes and crocheted pants and top. Alchemists believed that the transmutation of one substance into another was possible; thus we have the phrase "turn lead into gold.". I personally design every book which can take up to 2 hours. Scaled perfectly for your dollhouse, room box, dollhouse coffee table or a book shelf in your miniature scene. This is a nice and realistic rawhide-type dog chew, handcrafted by "Hudson River" miniatures in dollhouse (1/12) scale. This is a dollhouse (miniature) item. Kitchen Cookbooks set of 6. Scaled perfectly for your dollhouse the high resolution images give unsurpassed detail. Each book is hand made with PAPER PAGES and not wood so they have a very realistic feel. Reutter Porcelain Artisan Dollhouse Miniature Vintage Sink with Soap! 1:12 Blue. Condition is New. Shipped with USPS First Class Package. Beautiful Blue Ruetter Full size Sink.. I bought this piece some years back and never used it... i paid over $80.00 plus shipping. Its too modern for my victorian kitchen... The pics showes its beauty.. it has the drain pipe and a ribbed drain board with a Bar of Lux soap in the soap holder!.. this piece has some weight to it... A great starting bid! The top center piece is a 3D portrait. The detail is very sharp and crisp.It is finished in gold.The mirror is real glass--. It is approx. 2 3/4" tall by 4" wide. The Fireplace is used to show scale in combination with the Mirror. THE HOBBIT by J. R. R. Tolkien, opens and has 18 pages with 9 full color illustrations not including the two on the endpapers. The title is printed on the spine so it will look GREAT open or closed. Dollhouse Miniature Woven Rug 12 1/2" by 8"
It in my estimation in excellent condition. Fabric eyeglass case and a pair of blue wire sunglasses were made by Lucy. Case is a bit over 1/4" wide x 5/8" high. It is app. 2 1/4" by 2 1/4 ". Dollhouse Miniature. Handcrafted ~ 1:12 scale. Dollhouse Miniature Artisan Made Portrait Jumeau Doll 1 1/2 Inch. Condition is Used. Shipped with USPS First Class Package.